Paris shows its beauty at every corner including in its Métro. The interior design of the Paris Métro is not to be missed. While discovering Paris on foot, you may end your enchanting day trip by entering any of the following culturally-rich stations, appreciating the stunning design, then hopping onto a train back home. As each design celebrates a particular theme, you may match it with your mood or with your day trip theme. The Assemblée Nationale station is located near French National Assembly. It features silhouettes of deputies in its 90-meter long colorful murals, developed by Jean-Charles Blais. “Metro de Paris – Ligne 12 – Assemblee Nationale 05” by Clicsouris – Own work (Photo personnelle). Licensed under CC BY-SA 3.0 via Commons. The Concorde station is tiled in the text of the Declaration of the Rights of Man and the Citizen. The scheme was designed by Françoise Schein. « Metro de Paris – Ligne 12 – Concorde 06 » par Clicsouris — Travail personnel (Photo personnelle). Sous licence CC BY-SA 3.0 via Wikimedia Commons. 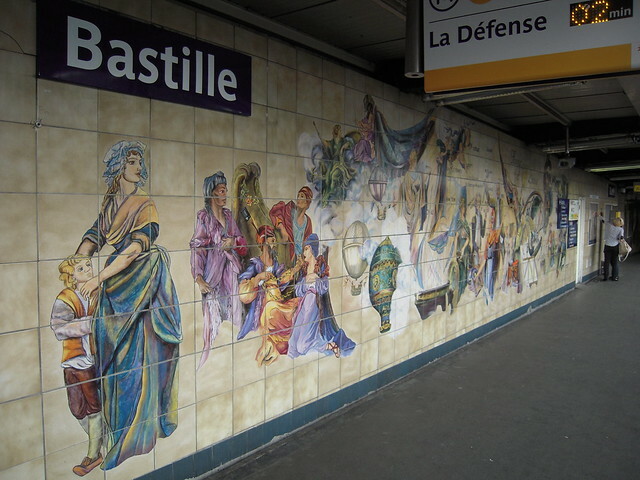 The Bastille station features murals of scenes from the French Revolution, and archeological remains of the notorious former prison. The Cluny – La Sorbonne station celebrates the writers of the Latin Quarter, with a tiled reproduction of Les Oiseaux by Jean Bazaine. The Louvre – Rivoli station is located near Musée du Louvre. It features stonework, statues and other replica museum pieces. “Station-louvre-rivoli” by Pline – Own work. Licensed under CC BY-SA 3.0 via Commons. The Mairie de Montrouge station hosts many works by Hugues Reip. « Métro Mairie de Montrouge quai vers le nord » par Fmjwiki – travail personnel. Licensed under CC BY-SA 3.0 via Commons. The Cité station lies underneath the Île de la Cité. The soft light from the low-hanging globes of the art nouveau street lamps bounces off the polished tiled ceiling and slick floor to great effect. “Metro-staionCIte-p1000475” by Rama – Own work. Licensed under CeCILL via Commons. The Arts et Métiers station is named after the school and museum of the same name. It features a Jules-Verne-like interior of a submarine and was designed by comic-book author François Schuiten. The Pont Neuf station is located near Monnaie de Paris (Paris mint). It features sculptures of oversized coins “dropping” from the ceiling and walls. The Cadet station is named after Rue Cadet, itself named after M. Cadet de Chambine, owner of much of the land through which the street passes. It is tiled in the stars and stripes of the American flag. Ribbons of red white and blue race from ceiling to floor. « Métro de Paris – Ligne 7 – Cadet 02 » par Clicsouris — Travail personnel (Photo personnelle). Sous licence CC BY-SA 3.0 via Wikimedia Commons. The Chaussée d’Antin – La Fayette station was originally named Chaussée d’Antin after the street of Chaussée d’Antin—which was named after the first Duke of Antin. In 1989 La Fayette was added referring to the famous shopping street of Rue La Fayette. In 1991, Toulousian artist Jean-Paul Chambas embellished the station’s ceiling with a mural depicting the American Revolution, featuring famous Americans like Elvis and Martin Luther King, Jr.
“Paris Metro Lafayette” by FloSch – Lafayette.jpg German Wikipedia. Licensed under CC BY-SA 3.0 via Commons. 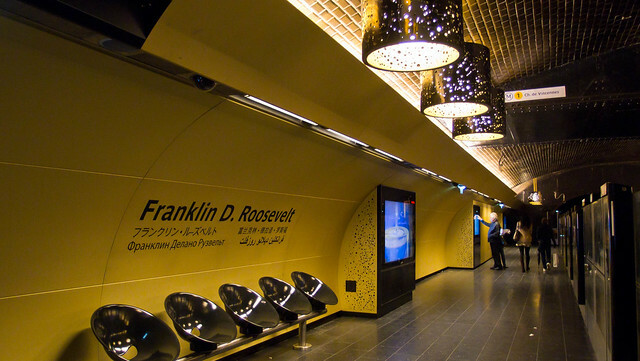 The Franklin D. Roosevelt station is named after Franklin D. Roosevelt Avenue, in honor of the American president who was an ally of France during World War II. It was remodeled with gold anodized plates and a vivid yellow and black colour scheme, topped off with hole-punched metal chandeliers. 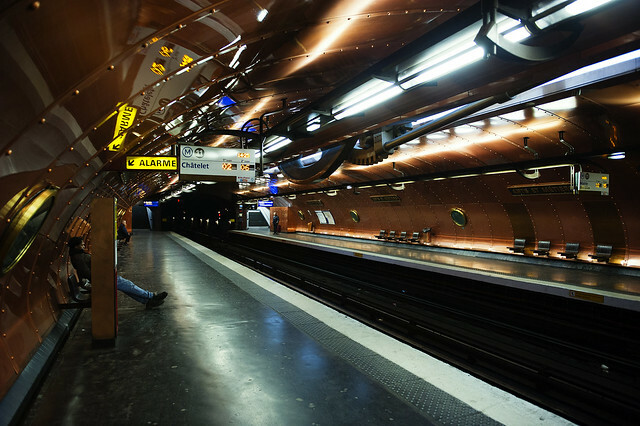 “Metro Paris – Ligne 9 – station Franklin D. Roosevelt 01” by Clicsouris – Self-photographed. Licensed under CC BY-SA 3.0 via Commons. It introduced an artistic technique known as “gemmail”, a type of stained glass art developed during the 1930s by French painter Jean Crotti. The Parmentier station is named after the 18th-century French scientist Antoine-Augustin Parmentier who promoted the use of potato as a food source at the end of the 18th century. It features green trellises along the walls, tractor seats for benches, and exhibits about the potato. « Metro de Paris – Ligne 3 – Parmentier 06 » par Clicsouris — Travail personnel (Photo personnelle). Sous licence CC BY-SA 3.0 via Wikimedia Commons. The St-Germain-des-Prés station is named after the Place Saint-Germain and the Abbey of Saint-Germain-des-Prés. It presents projections of the musings of the neighbourhood’s postwar philosophers. “Metro Paris – Ligne 4 – station Saint-Germain-des-Pres 01” by Clicsouris – Own work (Photo personnelle). Licensed under CC BY-SA 3.0 via Commons. The Tuileries station is located underneath Rue de Rivoli near the Jardin des Tuileries, for which the station is named. Its artwork represents many examples of 20th century history and culture. “Station Tuileries” by Pline – Own work. Licensed under CC BY-SA 3.0 via Commons. 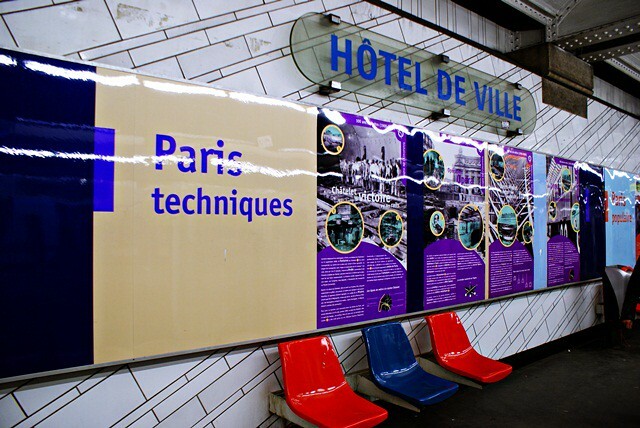 The Hôtel de Ville station got its name after the Hôtel de Ville de Paris (Paris City Hall). It was then decorated with a documented gallery picturing the History of Paris City Hall. The Villejuif — Léo Lagrange station is named after Léo Lagrange, a French socialist politician and under-secretary of state for sport. The station is decorated with sporting exhibits. “Ligne-7-Ville-juif-Leo-Lagr” by Pline – Own work. Licensed under CC BY-SA 3.0 via Commons. The Carrefour Pleyel station is named after Carrefour Pleyel (“Pleyel crossroads”), which is named after the Austrian composer Ignaz Pleyel who founded a musical publishing house in Paris. It was decorated on the theme of “music” for the centenary of the Paris metro. « Métro Carrefour Pleyel 1 » par Jupiter75 — Travail personnel. Sous licence CC BY-SA 3.0 via Wikimedia Commons. Every inch of Paris is beautiful, whether you are on foot or on the Métro. The city of Paris is one vast and versatile cultural museum. With a Métro pass and your feet, you’re immersed in an artistic and inspiring city that keeps you awake, excited and enlightened. Subway stations are no longer uniform and taking the Métro in Paris becomes a source of enjoyment rather than a boring chore. You come to realize that Paris is not only about the Eiffel Tower and a few obvious attractions. The city itself is one big attraction and the only way to experience it to the full is to move there. I agree. You can even appreciate “street art” if you are sensitive to it between the subway stations. I am speaking about those tags and graffitis you can find painted in black and white in the tunnels during your daily commute. I am oftenly amazed with the complexity of some of them. Ah the Tuileries always reminds me of that scene from Paris je t’aime with Steve Bushemi 🙂 Beside the great decor of Parisian metro stations, I always adored seeing so many people reading books while in train, especially on line Neuf to Sevres (or this is just my impression as I spent a lot of hours in this train :). And even the commercials are often very arty! That’s what Paris enchants us. Different cities inspire me in different ways. I feel alive when I’m in Paris. Incredible! Even taking the subway in Paris is an unreal and marvelous experience. There we can say good bye to the boring trips in the subway and welcome the enjoyment of traversing the city beneath it. And I like the idea expressed in the title of this post; we can simply match our mood with the stations because they recreate several themes. It is wonderful that all of this is below the city for us to delight while going from one place to another. Paris Metros rock. Reading the post and seeing the photos makes me want to hop on to a train and enjoy the underground artistic view. Parisians really did think of everything when they created such unique art so the people could have a blast while travelling regardless of where they are headed. This is beyond delightful. Ha ha, I have always been puzzled by underground stations’ names in Paris! Unfortunately, many stations in Paris have names that sound a little weird to me, and desk research is mandatory to understand everything LOL. Indeed, many stations have names that are linked to the History of France: dramatic battles, famous French people or popular names, crucial in the history of the Republic. However, most visitors ignore these names, I’m afraid!